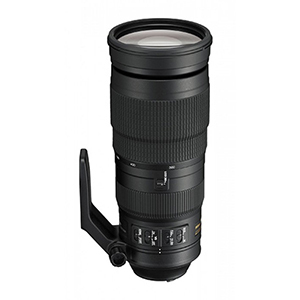 The Nikon 200-500mm f/5.6E AF-S ED VR offers Telephoto Zoom at an affordable price. A 4.5-stop VR provides excellent stabilisation at long focal lengths, ensuring sharp, blur-free images when photographing distant subjects. ED (extra-low dispersion) elements help optimise sharpness and contrast rendering beautifully detailed images. The 200-500mm features a closest focus distance of 2.2m and weighs only 2.3kg.